Fourth Row Center: Film Writings by Jason Bailey: Saturday Night Netflix: "Midnight Express"
Alan Parker’s Midnight Express is a tough, troubling, difficult picture. It’s thoroughly unpleasant to watch, loaded as it is with brutal assaults and grisly torture and people losing their minds; it also includes some cringe-inducing xenophobic attitudes and dialogue (which screenwriter Oliver Stone later apologized for). It’s structurally wobbly, and full of odd interludes. But you can’t deny director Parker’s ability to work over an audience; his direction is tight and sometimes unbearably tense, and he manages to draw us in to a story with a serious shortage of sympathetic characters, primarily through the sheer brute force of his imagery. The film is based on the true story (reportedly much exaggerated, however) of Billy Hays (Brad Davis). An American on vacation in Istanbul with his girlfriend in 1970, Hays tries to smuggle a couple of kilos of hash back to the States, only to get busted and sent, indefinitely, into a Turkish prison (the movie single-handedly made “Turkish prison” synonymous with “living hell”). With the help of his father (Mike Kellin, in a fine performance of deeply felt frustration) and an expensive lawyer, he gets a three-year sentence for possession, but fifty-three days from the conclusion of that term, a higher court overturns the sentence and instead finds him guilty of smuggling—a thirty-year bit. This is around the time he starts looking to escape, and by the time that fails, he has gone a little bit crazy. The strength of Stone’s screenplay and Parker’s direction is in its portrayal of Hayes’ slow, steady descent into real madness; it’s that old saw about how, if you treat a man like an animal, he’ll turn into one. When Hayes makes the switch, Parker is ready with a full arsenal of stylistic tricks: slow-motion photography, scary music, abstract sound, and plenty of blood and gore. But it’s a slippery slope to get him there; the primary difficulty with telling this particular story is that you’re asking an audience to sympathize and identify with a protagonist who is, semantics and connotations aside, a drug smuggler. And at the time he commits that crime, that is literally all we know about him—Parker and Stone parachute into the action at the last possible moment, beginning the film with Hayes strapping the hash to his body and heading to the airport. There’s no denying how unnerving the customs sequence is to watch; it’s scored with heartbeat percussion and builds up some genuine tension (in spite of the fact that we know he’s not going to get away with it—if he did, there’d be no movie). But that speaks to the skill of Parker’s filmmaking; since we know nothing about this guy, we’ve got no good reason to want him to get away with it. In the scenes that follow, Stone’s best notion for getting us on the protagonist’s side seems to be making Hayes into a dumb, naïve kid, and letting us see how he is ruined by this corrupt, foreign, evil system (never mind that the good ol’ U.S. of A is not exactly renowned for the common sense proportionality of our drug sentencing). Not long after that, Hayes finds himself in court, having his sentence upped. This is one of the more troublesome scenes in the picture; his big courtroom speech, which includes some of the most obviously anti-Turkish sentiments of the film, is full of the less-than-subtle dialogue and reckless hyperbole that have been a thorn in the side of Stone’s critics in the years to come. And I’m not sure if even the Oscar-winning screenwriter can explain the film’s sudden, peculiar dipping of its toe into the waters of homoerotica (or its goofy retreat from that subject matter). 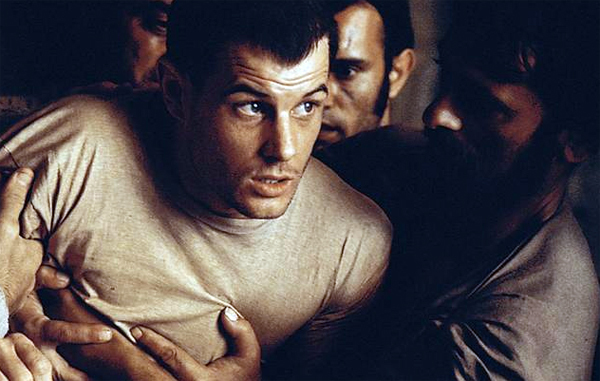 For all of its problems, however, Midnight Express is unquestionably effective. Parker seems to see it, first and foremost, as an antsy, jittery mood piece—he doesn’t let a lot of sunshine in to his frames, and his handling of the story’s violence is demanding and relentless. The direction is particularly compact during a nervy escape attempt; he shoots and cuts the sequence with razor sharpness, made stronger by the choice to go without music. The score itself, by Giorgio Moroder, is a mixed bag; renowned at the time for its innovative use of synthesizers (it was the first all-synth score to win an Oscar), the dread-filled music works beautifully in the first act, but is alternately bombastic, syrupy, and button-pushy through the rest of the film. We’ve seen before how nothing can date a film quicker than an inappropriate score, and that’s often the case here (particularly in that unfortunate shower scene). The performances are interesting, if not altogether successful. A young, thin Randy Quaid is a little over the top, but Paul Smith (later to play Bluto in Altman’s Popeye) is a terrifying presence, and John Hurt turns in a quiet, skillful performance (he nabbed a deserved Supporting Actor nomination). Davis’ performance mostly works—he does the turn from in-too-deep bonehead to slobbering, masturbating mess believably and smoothly. His only real fumble comes in the scene where he finds out about the change in his sentence and loses his cool; Davis, at least in this film, is better in reactive mode, and he can’t quite land this scene where he blusters and yells and must command the screen. But for the most part, he is a fine anchor for this graphic, vivid, forceful film. Looking back over this review, it reads more negatively than it should; it’s easy to pinpoint what’s wrong with Midnight Express, and harder to express how, in spite of those flaws, it’s still an impressive and important film. It is, for all intents and purposes, a sensationalized melodrama, but that doesn’t mean it doesn’t work, at least on that level—it gets a rise out of us, it shakes us up and beats us down. Pauline Kael deemed it “movie yellow journalism” and called it “a crude rabble-rouser”; she’s right, of course, but what of it? Parker and Stone have applied their considerable skill and technique to tell a story that is harsh and potent, and their film gets, presumably, the reaction they were going for. Whether their accomplishment is an admirable one is up to each viewer to decide. "Midnight Cowboy" is available on DVD, Blu-ray, and Netflix Instant.